Black Moth Super Rainbow - "Start A People"
Besides having one of the best band names I’ve heard in a long time, the self-styled "electronic junk band" Black Moth Super Rainbow have taken on the challenging and intriguing venture of re-creating the sounds of the early 70’s, as heard through the ears of a child. Pretty ambitious, considering none of the band’s members were even alive in the 1970’s! Well, speaking from the point of view of someone who was a child of the early 70’s, I can tell you this album somehow did manage to induce fond and patchy memories of my early youth. Nothing specific, you understand. That’s the magic of Start a People. It can take you back to a time you think you remember, without actually remembering it. Does that make sense? Who knows? But I think this album could just as easily appeal those who were not necessarily a child of that era as can to those who were. 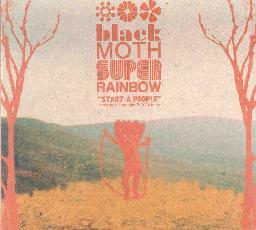 With an array of analogue synths at their disposal, mangled tapes, and cheerfully cheesy vocorderized vocals, Black Moth Super Rainbow comes across as sort of a lo-fi, more experimental version of the French duo Air, with a lot more warmth and dizzyingly fragmented nostalgia thrown in for good measure. Great titles like Raspberry Dawn, I Think It’s Beautiful That You are 256 Colors Too, Early 70’s Gymnastics, Folks With Magik Toes, and I Am the Alphabet evoke the colorful, sunshiny magic television world of Make a Wish, Sesame Street, H.R. Puff n’ Stuff, and School House Rock without ever making a single specific reference to any of those. What can I say? This album was a complete surprise and I totally dug it. I think you’ll dig it too. Welcome to the 70’s, man. Start A People is distributed by The 70s Gymnastic Recording Co. You can visit their web site at: http://www.70sgymnastics.com. Contact via snail mail c/o The 70s Gymnastic Recording Co.; 2290 Linwood Drive; Allison Park, PA 15101.